A broken item can be given a new, possibly better, appearance when repaired. 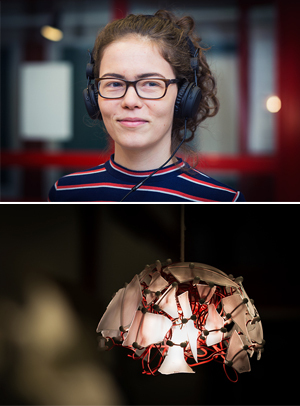 “Actual repair” has been the theme of first-year students taking the master’s programme in design, exhibited in Design4Repair. Today’s consumer society is coming under increasing scrutiny, and reuse has become trendy, being on display even at events such as the Nobel Prize celebrations. Repairing broken items is also a way to reduce consumption. Students of design have improved on the idea of simple repair, and create new appearances for broken items by repairing them. “The concept of ‘Actual repair’ means not only to design items such that they can be repaired – it’s nearly impossible, for example, to open a mobile phone and get inside it. It also means repairing items in a visible manner, giving them a completely new appearance”, says Linnea Michel, one of the students. At the end of the course, the master’s students organised the Design4Repair exhibition to show their work. The exhibits included items that had been brought into the Repair Café that they held during the autumn. The exhibition has many examples of attractively repaired items. Some were repaired using kintsugi, a Japanese method to repair broken crockery with gold-based glue. A torn jumper can become two new ones, more attractive than the old one, if it’s cut and sewn together with halves from another jumper. And a shattered glass lamp can be put together again in a new way. Linnea Michel worked in a group to create a model for an exhibition that demonstrates the amounts of cotton, water and work required to manufacture a single item of clothing.